Partie Septentrionale du Governem? General de Champagne ou se trouvent le Retelois, le Rhemois, la Champagne propre, Partie de la Brie et du Pertois, etc. 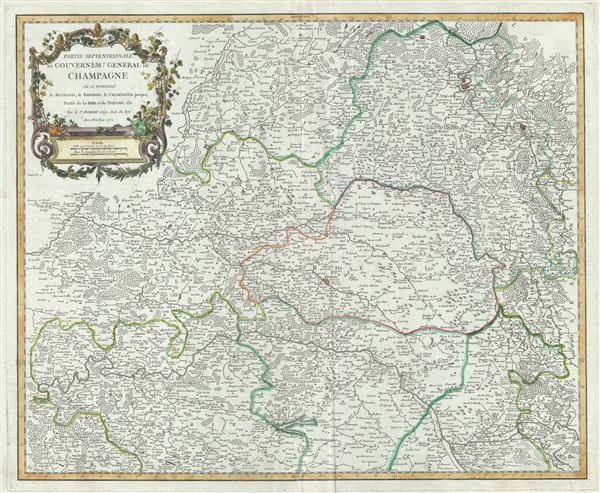 This is a beautiful 1752 map of the northern Champagne region of France by Robert de Vaugondy. Centered on Reims, it covers part of the Champagne-Ardenne and Picardy regions of northeast France from Meaux east as far as Stenay and Rocroi south as far as Vitry-le-Francois and includes the whole or parts of the modern day departments of Ardennes, Marne, Aisne and Seine-et-Marne. The map rendered the entire region in extraordinary detail showing roads, canals, rivers, cities, villages, chateaux, etc. The Champagne region is famous around the world for its spectacular sparkling wines of the same name. The Siene-et-Marne region hosts the annual wine and cheese fair. This area is known for its production of a brie-style cheese called 'Fromage de Meaux.' Over 25 liters of milk are used produce just one wheel of this raw-milk cheese. When ripe, its rind breaks at the slightest touch, allowing the beautiful, hay-colored, almost liquid paste to ooze out. Meaux, located in the lower left quadrant, is famous for France's best Brie Cheese, Brie de Meaux. A fabulous decorative piece for perfect for wine store, Champagne wine cellars, and French restaurants. A beautifully engraved title cartouche adorns the top left quadrant of the map. Drawn by Robert de Vaugondy in 1752 and published in the 1757 issue of his Atlas Universal. The Atlas Universal was one of the first atlases based upon actual surveys. Therefore, this map is highly accurate (for the period) and has most contemporary town names correct, though historic names are, in many cases, incorrect or omitted. Rumsey 3353.032. Pedley, Mary Sponberg Belle et Utile: The Work of the Robert de Vaugondy Family of Mapmakers, 125.